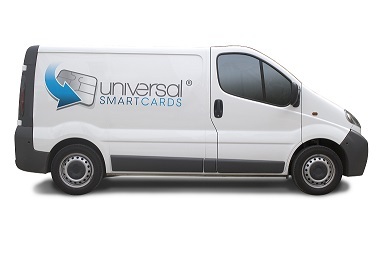 Delivery is a key part of Universal Smart Cards' service. We will always give the most realistic and achievable timescales before we take your order. To help provide better service to our customers we stock most popular memory, microprocessor and contactless cards. We also keep a vast inventory of readers, printers, consumables and card accessories to enable quick delivery. This allows us to offer shorter turn around times (next day on stocked items to around three to four weeks for non-stock, including printed/personalized cards). Furthermore, we package cards using corrugated outer cartons (capable of holding 500 cards at a time) to fully protect your order during the transit. Please note that turn around times will vary by product, specific requirements and stock availability. Delivery dates may also be affected by public/bank and local holidays. If placing an order online, you may wish to contact us for confirmation of the delivery date. We will confirm stock levels within 24 to 48 hours when an order is placed on a business day. Please feel free to call (1-800-810-4959) and we will happily answer any questions you may have. Twin/Hybrid Cards... What Are They? Dual Interface (Combi) Cards... What Are They?